284 pages | 45 B/W Illus. The discovery of Toll-like receptors (TLRs) in the late 1990s ushered in a new age of discovery for innate immunity. The importance of TLRs for immunology and biomedical research was recognized with the Nobel Prize for Medicine or Physiology in 2011. The prize was shared by three scientists: Ralph Steinman (for the discovery of dendritic cells, which express TLRs and whose activation by them provides a link between innate and adaptive immunity), Jules Hoffman (who made the pioneering observation of Toll in fruit fly anti-fungal immunity) and Bruce Beutler (who uncovered the role of TLR4 in the response to LPS). Work on TLRs inspired many researchers, and led to a search for other receptors in innate immunity. There are now several additional families of such receptors known, notably RIG-I-like receptors (RLRs), C-type lectin receptors (CLRs) and AIM2-like receptors (ALRs). A notable feature is the detection of nucleic acids from pathogens, but also from host cells in certain contexts, particularly in autoimmune diseases. 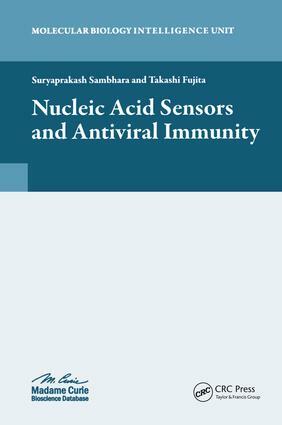 Nucleic Acid Sensors and Antiviral Immunity presents a timely and extensive account of the detection of nucleic acids in infection and inflammation. We have chapters by Beutler, Hoffman and Shizuo Akira, who is the most cited immunologist of the past ten years, for his work on innate immunity, which gives us an indication of the importance of the field. Several other pioneers in the field present comprehensive and highly lucid up-to-date accounts of their particular interests, revealing the large amount of activity in the past few years, as the literature continues to grow and become ever more complex. The fly yet again provides new insights, and anti-viral mechanisms in this key model organism are described. Other topics include the ability of viruses such as poxviruses, hepatitis C virus and HIV to interfere with detection and signalling; new insights into signalling including subcellular localization of signalling proteins, complex regulation of TLRs and RLRs by ubiquination and negative regulation by miRNAs; and the role of autophagy in antiviral defence. The importance of the RLRs in viral detection is widely reviewed. DNA sensing by ALRs and other receptors is extensively described, and the prospect of additional as yet unknown receptors for DNA debated, revealing a field that is still burgeoning. The prospect of therapeutic utility is covered in the context of using nucleic acids or other compounds as agents to promote anti-viral immunity. This book therefore represents an unprecedented account of this important aspect of immunology, by a stellar cast of authors who have defined the field. We have a key resource which should act as a primary source of information. The chapters will inspire researchers to continue on their quest to provide mechanistic insights into anti-viral innate immunity. The discoveries provide us with new strategies in the never ending war between humanity and viral infection, and will help in the ultimate goal to provide treatments to use against viruses which continue to present a major threat to human health.